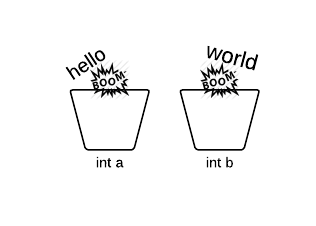 There are different types of containers for different types of objects. For example, you can have a container which holds an integer (like 6), or another container which holds a String of text (like "hello"). 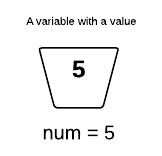 In this case you declared a variable called num, which can hold an int or integer. 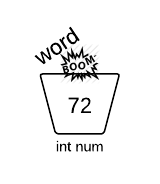 num is now 72 instead of 5. Since num was declared as an int, you cannot assign it the String "word". A method is a block of code that can be called by other code. In this example, the code at the bottom (that we said you could ignore), calls the method doStuff and it does stuff. By putting pieces of your code into method blocks, you can keep things organized, and you can call the same code multiple times from different parts of your program. 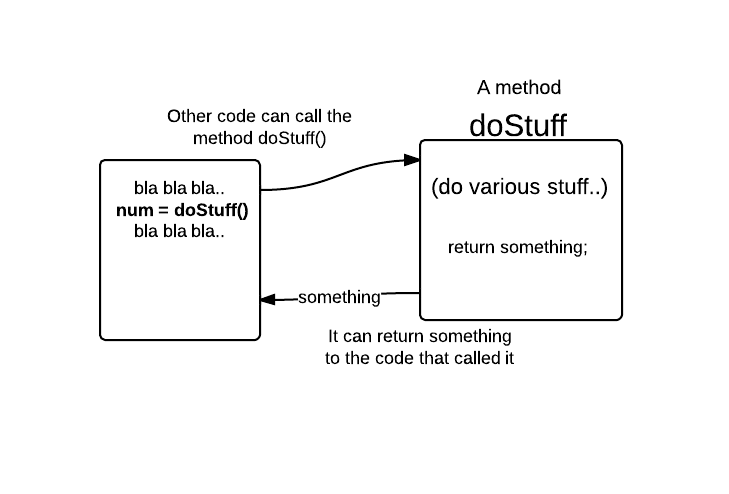 Note that you will usually want to name your methods with a more descriptive name than "do stuff". 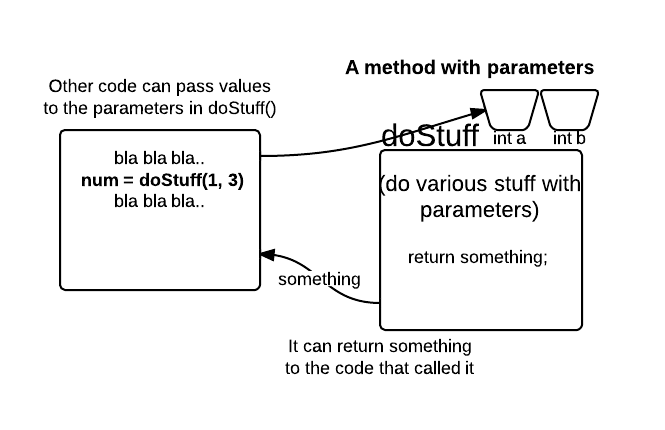 In many cases, methods can be used like parts of a logical flowchart seen in Algorithm ways. The method takes in two variables, a and b. Variables that are taken in by a method are called parameters. They are declared in the opening parentheses of a method and are assigned a value whenever the method is called. If the method is called again, they are assigned new values. doStuff("hello", "world") //will cause an error! This is because, the method declares a and b as integers so they cannot receive Strings! In the challenges on this site, the code on the bottom of each challenge passes in numbers to the method doStuff (which get assigned to the parameters a and b). You need to fill in doStuff so it "does something" with a and b and returns the correct answer to the code that called it. As in the previous challenge, you will be given the method doStuff which takes in two parameters a and b. (You should replace //your code here with your own code.) For this challenge, you are to return the average of the two numbers, rounded down to the nearest integer. Guideline: Create a new variable to store the sum of a and b. To get the average of the two numbers, simply divide that sum by 2 with /, and return that result. / will automatically round the answer down. Return the Average of any two integers, rounded down. Declare an integer variable age and assign it a value of 22 in one line of code. This one was a doozy for me. I tried to change the variable name(doStuff) and create new values within the name variable I created. Anyways I must have written 3 or 4 lines, just to find out I only needed to simple lines :( . I love this site. Thank you very much! It is taking a very long time to show the results and it is really annoying. I was more confused about the value of int a and int b then anything i couldn't work out how it had come to the results if no number have been declared. so i was trying to declare it the whole time which failed me. Its not as complicated as it first seems. Just remember how the order of operations works when you write the code. you are putting variable sum inside parenthesis which is wrong. Have tried several times but getting "Compilation failed" Where do I go to check the correct coding? oh That was so easy. this site is very useful to me to learn javacoding..
the average is the sum of variables / the # of variables.